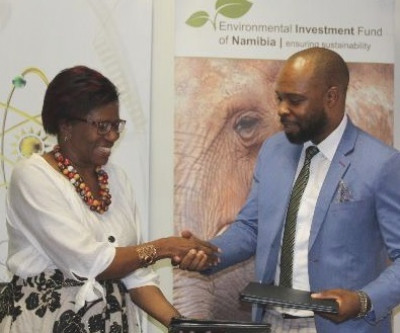 The Environmental Investment Fund of Namibia cemented another key in-country relationship last week when it signed a 5-year cooperation agreement with the National Commission on Research, Science and Technology. Under this agreement, the two institutions will work together to establish joint infrastructure for climate technology innovation and incubation centres. Representing the highest authority in their respective organisations, the agreement was signed between the fund’s Chief Executive, Benedict Libanda and the commission’s acting Chief Executive, Enid Keramen. The fund and the commission will also share the burden to fund research in climate change adaptation, mitigation and sustainable land management. On the educational side, the partnership will make available funding for students focussing on environmental topics. Operationally they will join forces to develop a range of products and services to address climate change, and to draft and implement responses to climate change. This will be complemented by joint workshops, seminars and conferences, all contributing to build academic as well as contingent capacity. The agreement also provides for the joint funding of other initiatives relevant to climate change research and actions. Libanda said domestic agreements are an important pillar to sustain international resource mobilisation. The commission’s mandate includes monitoring and supervising research on climate change while the fund is tasked to procure and administrate funding for a relevant domestic climate change response in all its facets.